O&O Defrag Server Edition 21.2.2011 is certified defragmentation for Windows Servers for corporate customers. It includes an interface for network management through the O&O EMC, which allows for the distribution and administration of the software across an entire enterprise network. The program optimizes your hard disk and packs file fragments securely back together again. It's easy to solution ideal for both beginners and professionals. Fragmented hard disks put the brakes on the servers in a company and as a result, have an adverse affect on productivity. The level of fragmentation proportionally increases the time needed for accessing a hard disk. This, in turn, increases the amount of valuable time lost by each and every employee. Thanks to clearly displayed graphics and statistics, you can monitor the success of regular defragmentation. After every run, you get a graph showing the before-and-after stats. You can then base your configuration of the program on these statistics to optimize the success yet more. The read heads of a hard disk when reading an orderly (defragmented) hard disk are far less stressed and worn out, which substantially extends the life of your hardware. Even in the event of data loss, you have better chances of making a full recovery if you defragment. 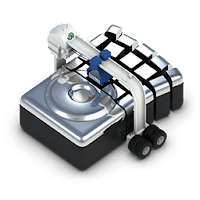 Data recovery software such as O&O DiskRecovery can reconstruct files saved after a defragmentation much easier than files that are spread across multiple areas of your hard disk. Moreover, O&O Defrag Server can also be used for deleting free space on hard disks. This prevents traces of confidential data left over from partially-deleted or temporary files from falling into the hands of any strangers. O&O Defrag Professional Edition - for home users. Server Edition - for Windows servers. Workstation Edition - for Windows workstations. Disclaimer: Direct downloads for the lastest version of O&O Defrag Server 21.2.2011 are provided by the official software's author, we can't guarantee safety, availability or download speed. Moreover, we don't and we won't provide any pirated/illegal versions or tools. We recommend you to avoid it as these methods can harm your device. If you like the software, buy it to support the developers. (We provide software discounts for many worldwide brands).